This Series 2 Mega Bloks Need For Speed Ford Shelby GT500 Super Snake is extremely hard-to-find and a must have for car fans! From the manufacturer: The Ford Shelby Mustang GT500 Super Snake is one of the most powerful American muscle cars ever build. It’s incredible 800 horsepower and 590 lb/feet. of torque along with Ford’s special handling pack, makes the Super Snake a lead-foot driver’s dream – and nearly impossible to catch on the open road. 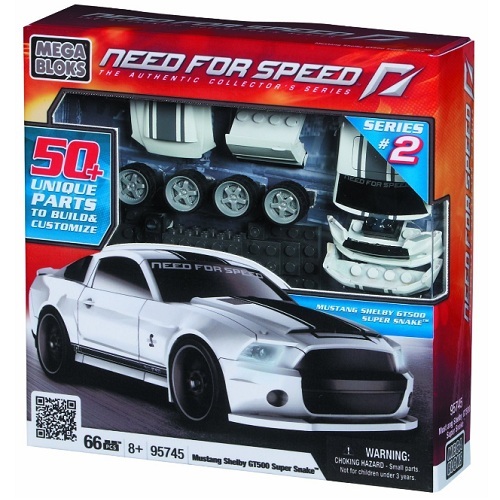 Customize your Ford Shelby Mustang GT500 Super Snake by Mega Bloks with cool interchangeable parts like alternate silver street mags or larger vented hood to make your ride truly unique. Build, play and display your Ford Shelby Mustang GT500 Super Snake for the whole racing world to see. Do you have the Need for Speed? Ideal for car buffs ages 8 and up.